The Raveonettes are a Retro Country Rock’n’Roll duo from Denmark who specialise in slow ballads. They harp back to the 1950s at a time when slow urban Rock’n’Roll was often indiscernible from its Country cousin. The sound is simple, enjoyable and confident, however for me the vocals had a tendency to grate when they weren’t being bland, and the lyrics were rarely anything much. Sometimes there’s a modern(ish) edge, when a 1990s Indie influence creeps in, but this is not frequent. The album opens with The Heavens, a plodding fireside ballad to a lost love or missing horse or something like that. It’s dripping in Country and, indeed, Western and there are frequent returns to the genre, particularly in the wistful Uncertain Times and Somewhere in Texas which is pure undistilled Country, not be taken neat. Love in a Trashcan is clearly the single as it was stickered all over the front of the album. This is an upbeat garage tune which is pleasant if uninspired. Sleepwalking actually has some atmosphere, and could almost be Transvision Vamp returning from the grave, albeit toned down. And Here Comes Mary is like Buddy Holly backed by The Jesus and Mary Chain, although that makes it sound better than it is. The mainstay of the album is the ballad, such as the typical If I was Young and irritating Seductress of Bums. Ode to LA sounds like cheesy Christmas Motown and My Boyfriend’s Back is a pop cover that will make you want to kill their manager. 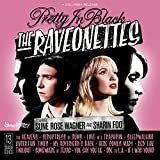 The Raveonettes, like a lot of bands, take the whole retro thing too far, and rather than making it their own thing, they tend to be very faithful and thus uninspired. A nice afternoon pub band, but was a record contract really necessary? Rating (/5): One Limp Danish Waffle.